How to Mitigate Foundation Settlement on Collapsible Soil? Different methods are suggested to handle collapsible soil. In most problematic soils, it is the best way to remove all soils that can produce large foundation settlement and replaced by soil that is safe against settlement. Does any soil type is safe? Same soil having in different state can be safe or unsafe. Say sand, cohesionless soil, is considered safe if they are in dense condition. Again sand having moisture and critical grading can suffer extensive settlement under vibration. We know the vibration is usually considered from earthquake shaking, the settlement term is not perfect here it is better describe by liquefaction. We have published many posts about liquefaction in this blog; you can visit them from top menu and left menu. A sand deposit that have no moisture or have relatively less moisture never subjected to liquefaction. So safe soil is relatively variable term depend on many factors. We use this term here as recompaction of sand is required to have a denser pack. The collapse potential of collapsible soil can be reduced by using compaction grout. We know penetration of moisture result severe settlement in collapsible soil. So we can introduce water by flooding or forcing water to penetrate like providing wells to make the deposit collapse before foundation construction as the soil skeleton reach to equilibrium condition under this method. In choosing foundation systems if possible select deep foundation. It is the safest way but most costly method to mitigate foundation settlement in this type of soil. Replacing deposit of collapsible soil is considered cost effective when they remain in shallow depth. Otherwise replacing and flooding techniques both is not valid. 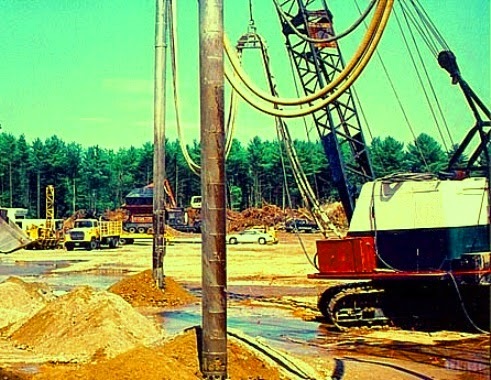 Deep foundation like piles can be rest on stratum below collapsible soil. Other foundation system like mat foundation or post tensioned foundation can also be designed to resist expected settlement in collapsible soil. Mat foundation is effective to reduce differential settlement. We have published many posts about design, construction and computer modeling of raft or mat foundation. We know collapse in natural soil or fill of the same are triggered with the penetration of moisture. Now if we can check moisture to penetrate the triggering mechanism becomes inactive and foundation will remain safe against settlement. So immediate repairing of any leak and break down in water or sewer line and providing effective drainage around building site to avoid ponding of rain water, in one word, all possible method providing moisture barrier will make your foundation and structure safe against collapsible soil.